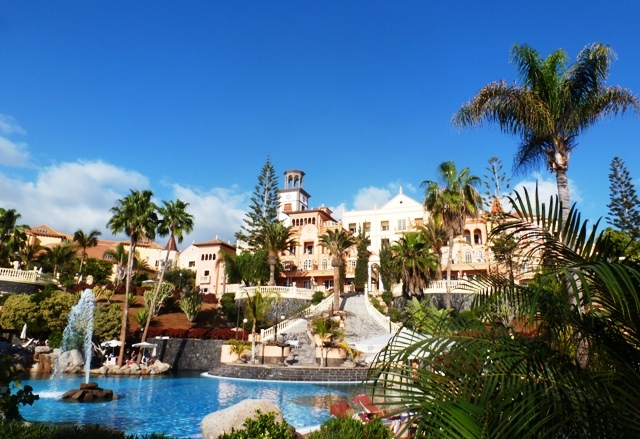 Driving through the gates into the grounds of the Bahia Del Duque Resort is to enter another world. A world of luxury, of beauty, of elegance and so many swimming pools that the lovely beach onto which it fronts is almost redundant. 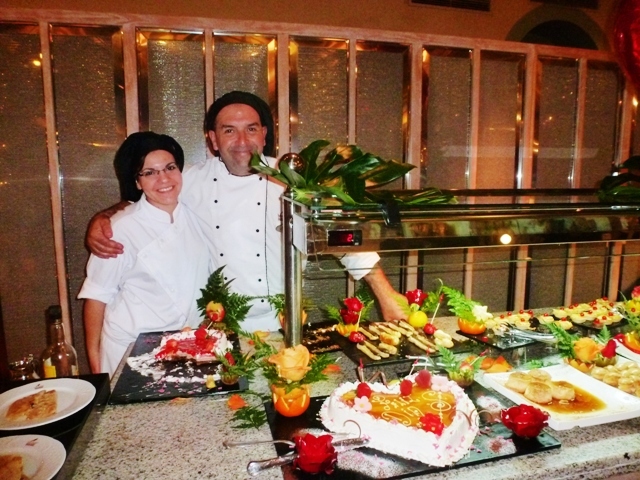 It’s a little village of escapism, hedonism, indulgence and delight. Well, that’s how I felt during a very brief stay in this up-market holiday complex on Tenerife. I’d recently been in the capital Santa Cruz taking part in the fun and craziness that is Carnival and needed a break – and this couldn’t have been a better place to unwind. 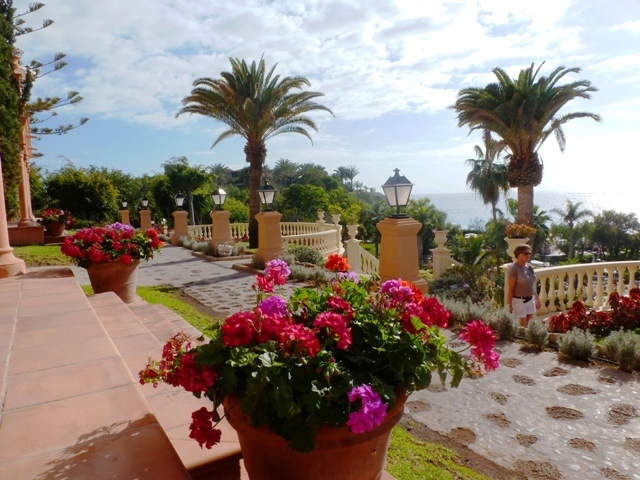 The grounds are extensive – 100k m² – and its tropical gardens are a microc0sm of the island’s lush flora. Architecturally it is very pleasing, being loosely based on 19th century Canary island buildings. The main body of the ‘hotel’ is vast and incredibly easy to get lost in. I was given a map of the grounds but really needed a sat nav to get from my room to reception. (Meeting up with fellow travel writers for dinner, we were all late – simply because none of us could navigate our way up and down the different floors, twisting corridors and myriad buildings.) My room was in the Campanile and a buggy transported me there from reception – walking took about 15 minutes! 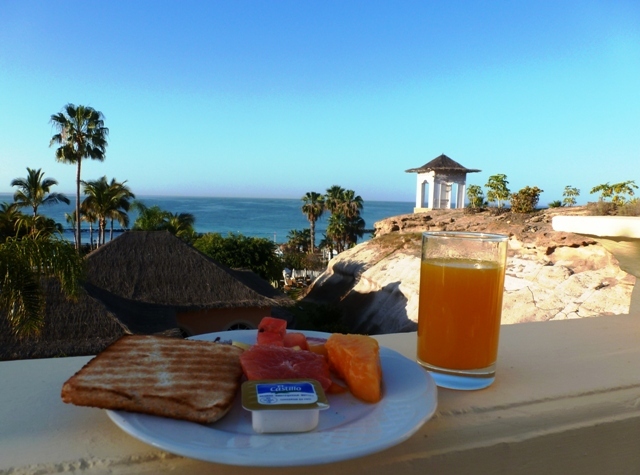 The suite had a pretty canopy above the bed and the balcony view was perfect – sparkling in the distance the deep blue waters of the Atlantic gently shooshed up onto the sandy shore of Adeje Beach. Before returning to my room to get ready for dinner, I went for a walk along the beach. 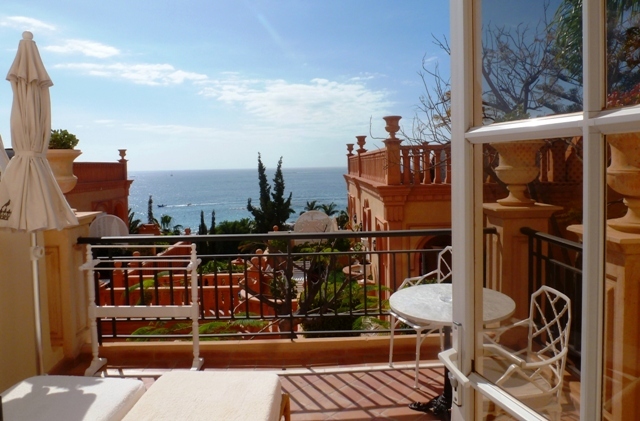 There’s a private exit from Bahia del Duque grounds and a series of luxurious changing pavilions. Adeje Beach is public, as are all in Spain, but not as crowded as some in this part of south Tenerife, and the sand is not as dark as some of the other ‘volcanic’ beaches. There were plenty of happy families having fun in the sun, people sunbathing, swimming, playing volley ball or simply wandering through the shallows of the warm waters. 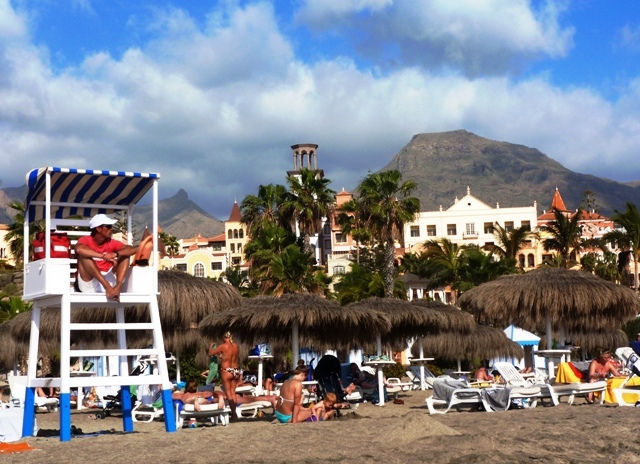 Tenerife is a magnet for astronomers as it is one of the best places in the world for star-gazing due to its geographical position and clear skies. So I was especially looking forward to gazing up at the planets from the resort’s little Observatory. No such luck. It just happened to be one of the cloudiest nights they’d had in ages and all we got to see was a little glimpse of the moon – which we could see outside anyway! 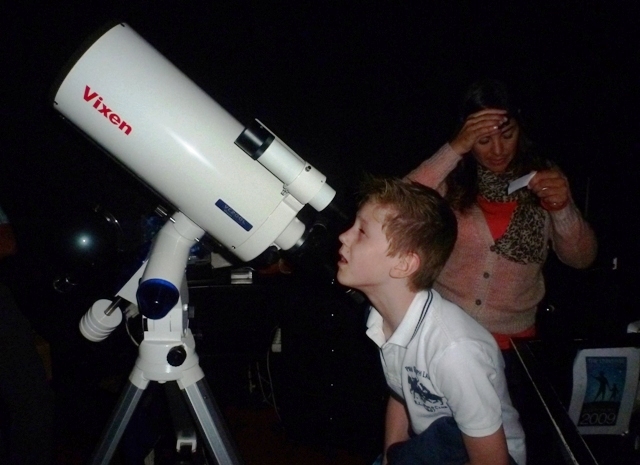 I was most impressed by this young boy who appeared to know more than the astronomer (looking perplexed behind him) showing us how to use the telescope. 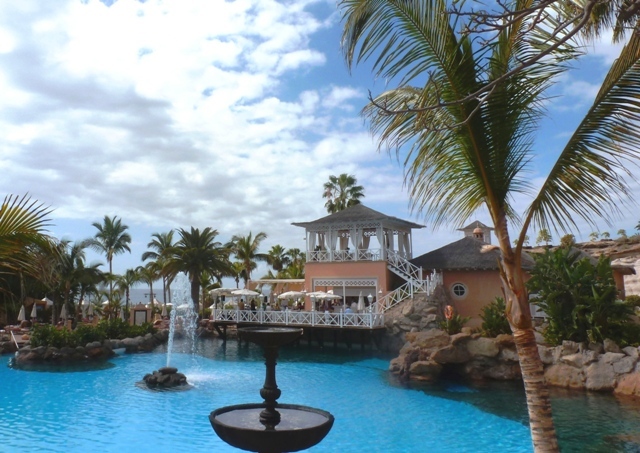 I travelled to Tenerife, one of the Canary Islands off the coast of Africa, courtesy of Tenerife Tourism and stayed in 5 Star luxury at the Bahia del Duque Resort on Adeje Beach. During my brief stay on Tenerife I had some exquisite fresh fish at a restaurant on a headland overlooking the sea, tried scuba diving, went caving in a lava tunnel, took part in the lively Carnival, visited a winery producing excellent wines and had a cookery lesson and walked aroudn some of the ilandscape.mporessive landscape in the north of the island. It really does have a lot to offer – much more than just sun, sea and beaches. Looks fantastic and I’m looking at the website NOW! Thanks for the tip. It really is as lovely as it looks Liz – and so lovely to get some winter sunshine at this time of year! Shared on my tumblr Tchau!